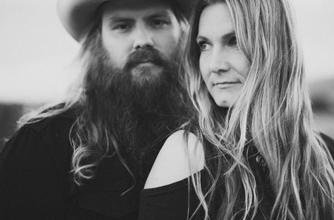 Morgane and Chris Stapleton’s rendition of “You Are My Sunshine” premiered last week; the song is the fourth track unveiled from Southern Family, a new compilation produced and conceived by two-time Grammy Award-winning producer Dave Cobb. The highly anticipated album, comprised of songs rooted in country, blues, folk and rock will be released March 18th on Low Country Sound/Elektra Records. Of his vision behind the project, Cobb has commented that he though it would be amazing to have all of his friends on one record, with the the songs tethered with one common thread, the Southern family. The tracks are about their mothers, grandparents, kids, siblings–detailed stories about how they grew up and their families and the things that make them who they are. Each song was conceived specifically for the album, except for this one, the Stapletons’ rendition of this revered, old time classic, a song that is sentimental and specific to their relationship and life together. Upon the very first listen, I was covered in goosebumps; the pair may not be biologically related, but their voices together are the finest example of blood harmony I’ve ever heard. Their bluesy, rootsy spin on the song truly makes it come alive in a fresh and relevant way. Take a listen, and be prepared to be overcome with the feels. All of them.